About 3 years ago, I started using allrecipes.com. I love it there and regularly save other people’s recipes. About a year ago, I put on my own family recipes that I wanted to access quickly if I forgot how to do it or something happened to the recipes written on paper. About 4 days ago, I got an email from Allrecipes saying they we going to put it on the site AND send it out during October in one of their daily blasts to kazillions of people all across the world! YIPPEE! But, I had to get to work and fix them again so I could post some pictures because the recipe was just for me and I already knew what they looked like. I’m so excited, it’s almost Halloween and it’s my favorite holiday. I mean, you get to dress up and be someone you are not AND you get free candy. What a great holiday! Many years ago, I wanted to make something special for Top Girl at Halloween so she would love it as much as me, but I couldn’t bake or cook or ANYTHING domestic. But, I always read Southern Living magazine and one year (I think it was about 1992) there were two tutorials on how to make Halloween spectacular if you cannot cook. 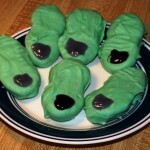 The following “recipe” was one and a haunted house was the other……..I made both. Let me tell you what, she LOVED it. I will try to make the haunted house again this year and show you how I did it – it doesn’t cost much and if I can do it, anyone can. In fact, I made it for several years in a row – once taking it to her school. Since it’s a really old recipe, I’m sure you’ve seen it or made them but I still love ‘em and for those who may not have, I wanted to share. You can make both with your children – or if they are old enough, they can actually make them alone. When Top Girl met Airplane Boy (now her husband) they met on Match.com on Labor Day. Halloween came and she made these cookies for him and I am pretty sure that’s when he fell in love. That boy loves these things almost as much as he loves Top Girl and Rocket! 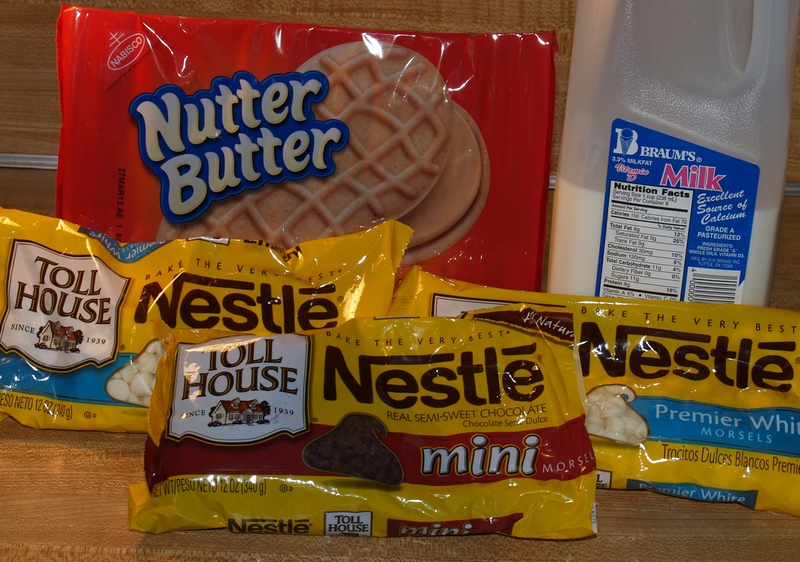 When I mentioned to Top Girl I was going to make these for a post and she mentioned to him, he went to the store and bought the stuff I needed. Seriously, he’s a good guy. They will be over later today to pick up all the cookies. I’m glad to give them away since I’m back on the diet for two weeks and they are very tasty. These are the ingredients you need, although you MAY not need the milk and if you would rather use the vanilla block of candy coating, feel free. I’ve done it both ways and it works out just fine. Melt the chips in the microwave or stove top according to package directions. 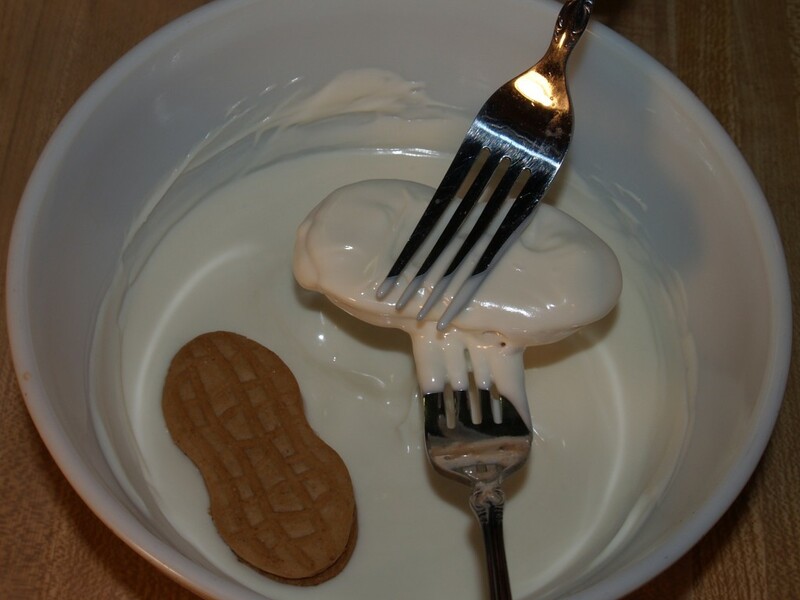 Using two forks, dip the cookies into the melted chips. Tap the side of the bowl to get the excess off. 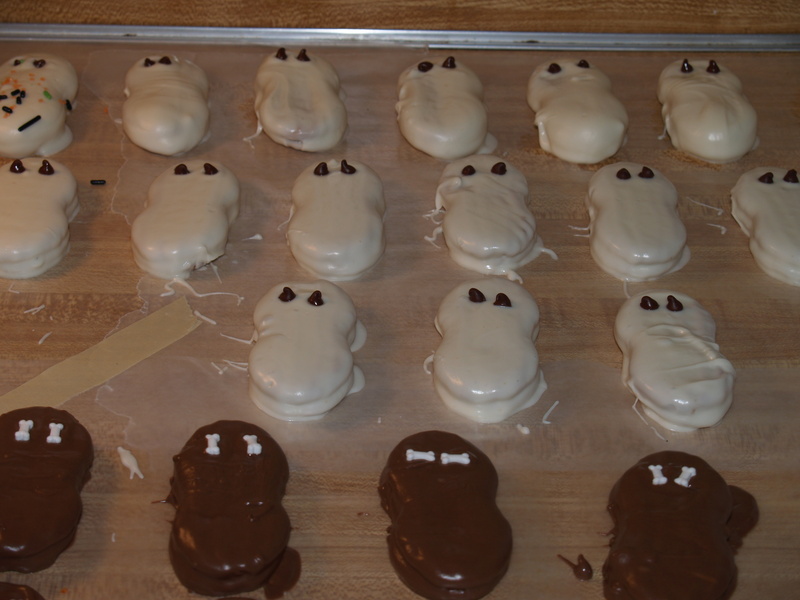 Wait about 5 minutes until the coating cools off and place 2 mini-chocolate chips for eyes. 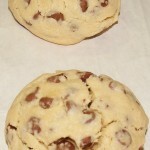 Let dry for a couple of hours or place on a baking try and put in fridge for 20 minutes. Ta-Da! 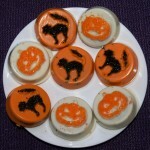 Halloween in a cookie! I made some chocolate ones with ½ the bag of mini chocolate chips because I thought they would be fun AND who can resist chocolate and peanut butter!?! 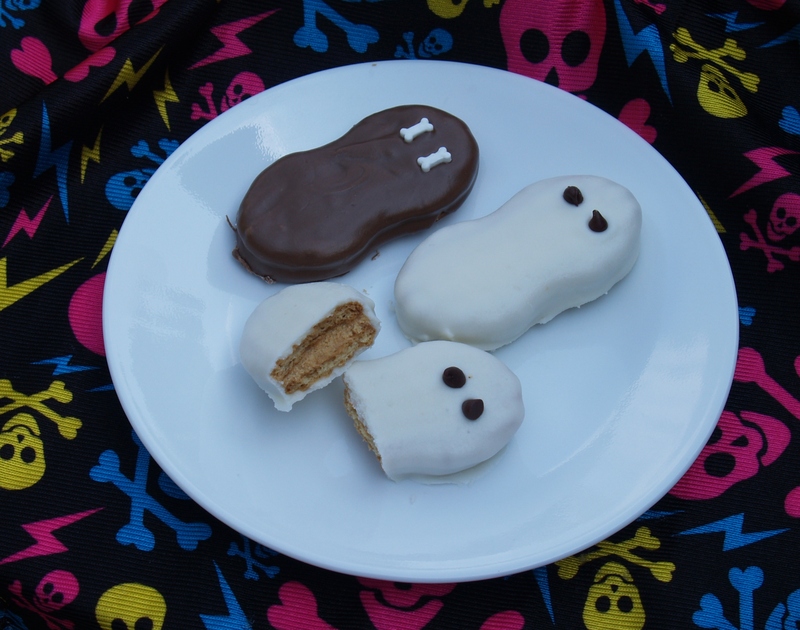 I used some bone sprinkles I got at Michael’s for another Halloween project I hope to show you later this week – aren’t they cute?? Cheap, quick, and tasty…………what more do you need? And, you can see how quickly these ghosts will turn into snowmen or if you are really hip – Shmoon (the plural of Shmoo). So who knows what that is? I may have another post today as we are repurposing like crazy for the 4-H foundation fundraiser. I believe I told you Lawyer Boy and Mr. Picky-eater sit on the foundation board and each year – on my birthday, dang it – play golf in a fundraiser for Oklahoma 4-H. We have got some cool stuff to contribute to the silent auction this year and if we finish today, I will post. If not, I will post when we are done! Those cookies are so cute and I know they’ll taste really great because I love the peanut butter cookies and chocolate would just make them better. I’ll have to try these. I’ll be on the lookout for your recipe – it’s a favorite site of mine, too, and I get their updates all the time. Great! Please let me know if you see them. 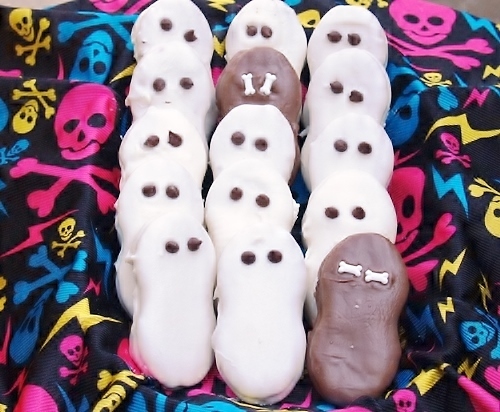 It’s called Halloween Ghosties on there as well! Thank you and I know you will love them! Thank you! I don’t know if you have Nutter Butter cookies over there but if so and you aren’t allergic, you should try them! I KNEW you would love the chocolate ! 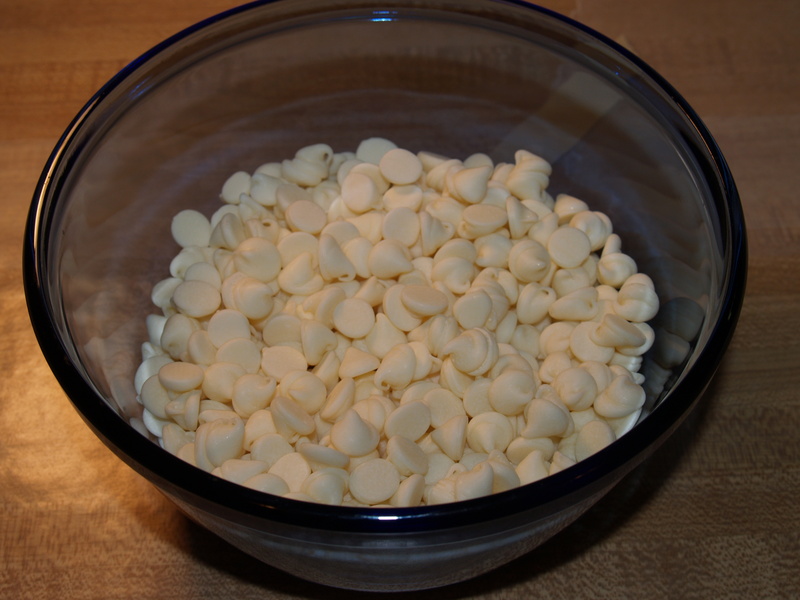 And today is National White Chocolate Day – just a coincidence. Sure wish I could eat one of those things! YUM! And congratulations on the All Recipes gig! Congrats 🙂 These are adorable! I have made these too. Many times. I saw them in a magazine who knows how many years ago. You can also do this at Christmas and make snow men using fruit roll ups for scarves around their necks and licorice gum drops shaped for hats. Congrats on your all recipe post. I have been a fan of that site since it started in the 1990’s. Thank you! I’ve also seen them coated in 1/2 milk and 1/2 white chocolate, mini brown m&m’s for eyes and a red one for a nose – then a small pretzel broken in 1/2 and put above the eyes. This looks like rudolph at Christmas – can’t wait to do the snowmen and Rudy this year!! Make sure you take pictures and post them!! You are most welcome! Thanks for dropping by and please come again! Congrats on the Allrecipes.com nod. That is definitely a great site, and you’ll get a lot of traffic from that! Great job. 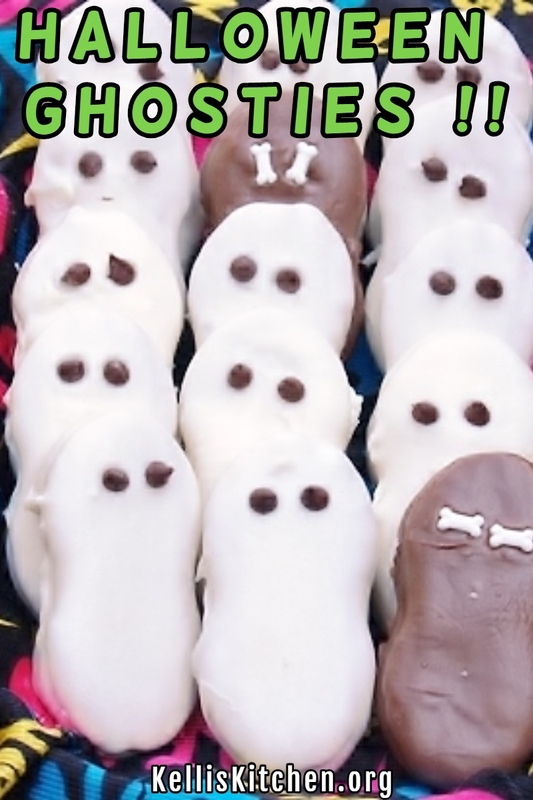 These Halloween Ghosts are way too cute!! 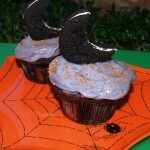 My daughter would love these and I am going to save this and make them for her for a special treat! She will love them! 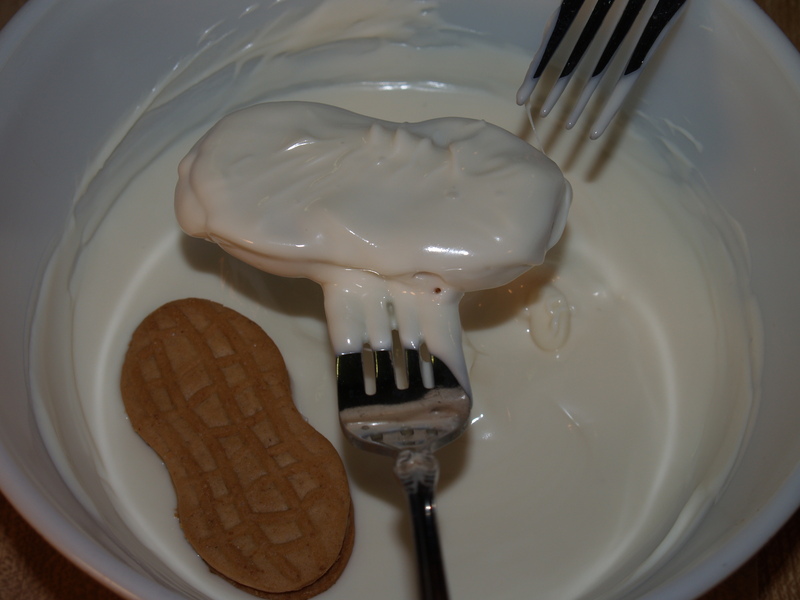 Closer to Christmas, I will be posting 2 other ways to prepare Nutter Butters that will bring in that holiday! Super cute, I am SO adding this to our repetoire for Halloween evening! !